Well, a million years and a new theme later, I’ve got a recipe for you guys! I feel so lucky and blessed to have parents who are so supportive of me and my blog. They comment on every post, share everything on social media, show it to people on their phones. My dad has a blog too, and we talk about blog stuff a lot. My mom is probably so tired of hearing it, but she never says that! 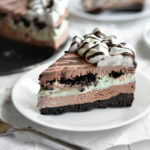 My first thought was to do an ice cream cake similar to this one from Southern Living. But with butterscotch. Which is totally an underrated flavor, by the way. There should be more butterscotch things in the world. While that fudge pie looks completely mouthwatering, I decided not to adapt it to butterscotch, but adapt my butterscotch brownies to more of a fudgy texture. It’s extremely easy to make, really. There are only seven ingredients in the pie, including the pie crust, which is just the store-bought kind. Super basic stuff! Pie and ice cream go together just as great, if not more, than cake and ice cream. Or maybe ice cream is just good with everything. 🙂 You can use whatever flavor you want, but I decided just to go with classic vanilla. To top off this Father’s Day treat, I made some butterscotch ganache to drizzle over it. 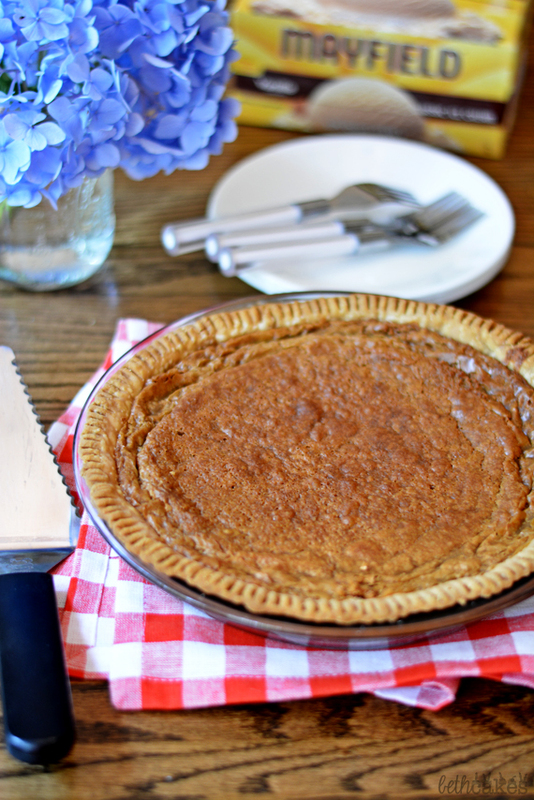 It intensifies the flavor of the whole pie and just completes it. Preheat your oven to 350 degrees and spray a pie pan with nonstick spray. Set pie crust out on your table or counter to thaw. Fill a double boiler with a couple inches of water and set over medium heat. In the bowl of the double boiler, add the butterscotch chips and butter. Stir constantly, making sure the butterscotch doesn't stick to the pan, until completely melted and combined. Remove from heat and let it cool for about 5 minutes. During that time, place the pie crust in the pie pan and press the edges with a fork. Then in a bowl, stir together the butterscotch mixture and brown sugar. Add the eggs and vanilla and stir just until combined. Next fold in the salt and flour until just combined. 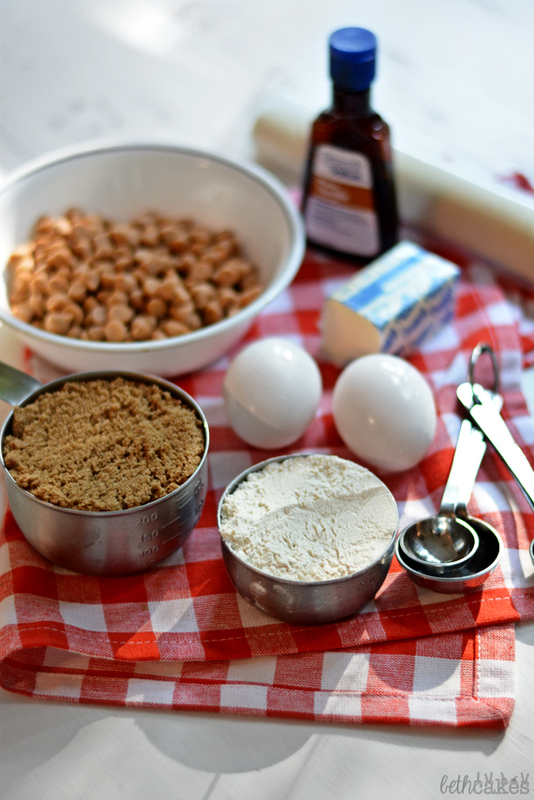 Pour batter into the pie crust and sprinkle with butterscotch morsels. Bake uncovered for 10 minutes. Then cover the edges of the pie with foil so the crust won't burn, or cover the whole pie with foil that has a large circle cut out of the middle so that the batter is exposed and the crust is not. Bake for 30 minutes, or until center has set. In a small saucepan over medium heat, bring cream to a simmer and then remove from heat. Pour cream over butterscotch morsels in a heat-proof bowl. Let the cream sit for five minutes and then stir until smooth. 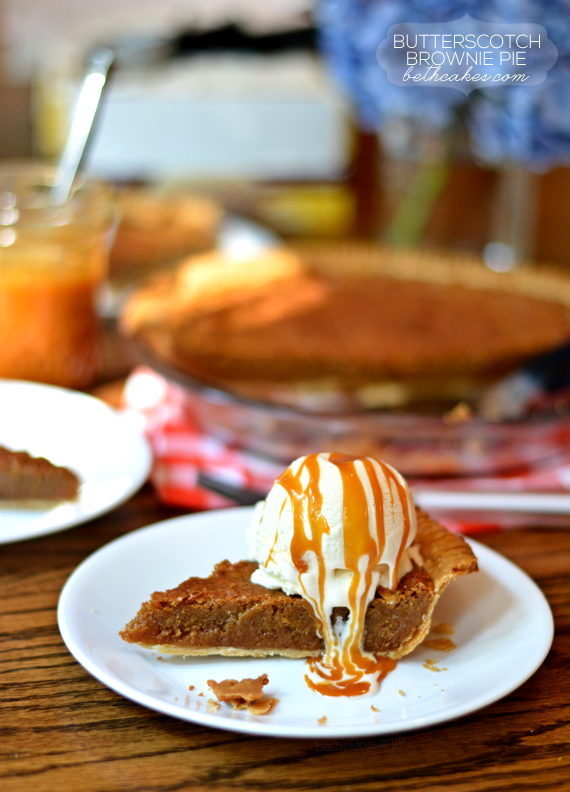 Drizzle butterscotch ganache over pie and ice cream. Gorgeous hydrageas! I like the way your dad thinks. Butterscotch is definitely one of the most delectable flavors but is often overlooked. 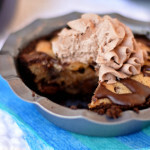 This brownie pie looks incredible! This looks divine! I wish I had your baking talent! Or just a cooking talent in general. Yummy! 1) Love the new look! 2) your dad is the coolest for having a blog! Love all the woodworking plans he has up there! Beth I love your new site design elements! So great! 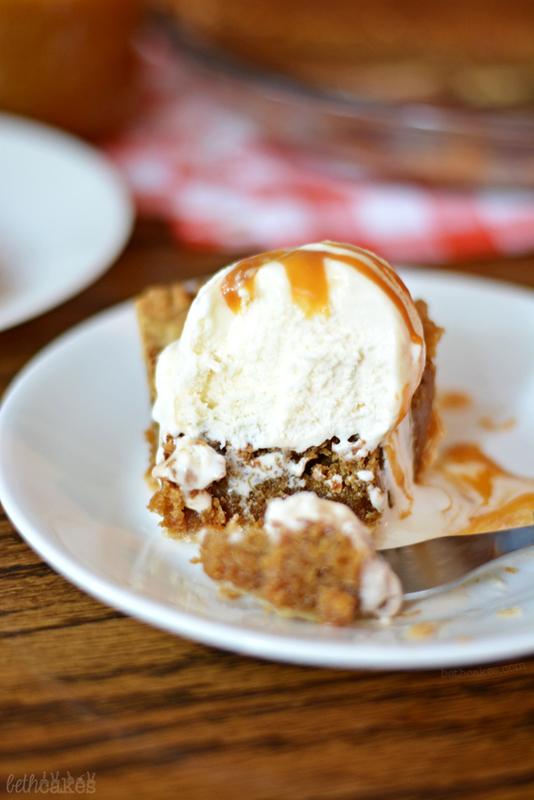 And is butterscotch brownie pie is totally making me drool. Way to rock the photos (as always)!! I love how fudgy you’ve made this pie. Pinned! 🙂 Hope you had a great weekend! Thanks so much, Chelsea! Hope you had a great weekend too! Such a great father’s day treat! Man, I know my dad would have loved this! 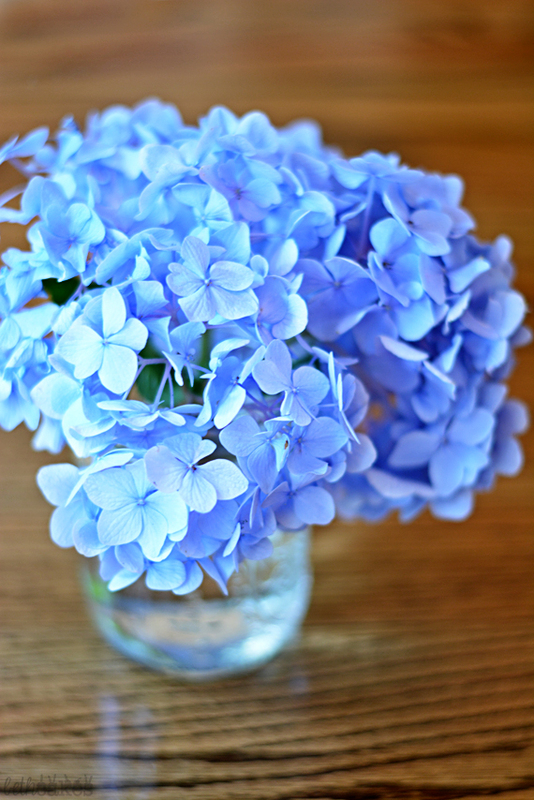 Maybe for his birthday : ) And I love those hydrangeas – that color is just gorgeous! 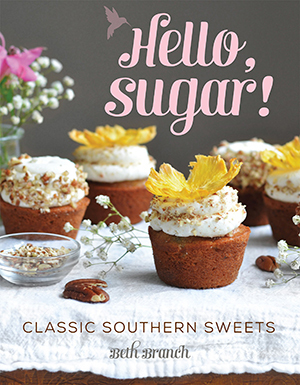 Oh my goodness Beth, this looks insanely delicious!! My dad’s totallllly a chocolate guy, but my mom would love this 🙂 it looks so utterly scrumptious. Stunning photos as well! Pinned. Thanks, Rachel! “Utterly scrumptious” are good words for it. 🙂 Also thanks for pinning! 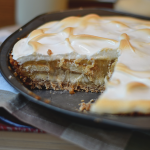 This was really, really, really good – so good I was calling it “Crack” pie because it could be addictive! Wow Beth this looks like an amazing Father’s Day present, I bet your dad loved it!! It looks so rich and that perfect scoop of ice cream on the top with the butterscotch drizzle is just divine. First of all, amazing amazing pie!! 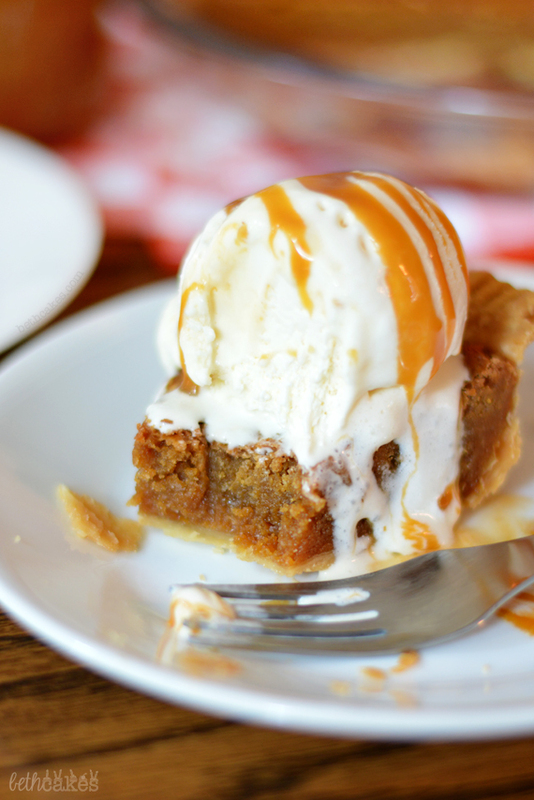 Butterscotch is my favorite and I am craving a piece of this right now. Second of all, I love the new look!! I bought this theme after your last post and I am working on installing it. Looks so great!! I love how much your photography is improving! Great pictures. I agree that butterscotch is SUCH and underrated flavor, and love that your dad encouraged you to make this. Thanks, Faith! Butterscotch is totally underrated, and I’m glad that you agree! I really like butterscotch; it is a flavor that is often overlooked I think. Beth’s Butterscotch Brownie Pie was super tasty. I highly recommend it. Looking good around these parts! Also, you can make me that pie ANYTIME! YUMMMMMMMMMM!!!!!! YUM! I usually put butterscotch chips in with the chocolate chips in my chocolate chip cookies, but I haven’t tackled any other butterscotch baking. This looks awesome, though, and I love that it’s so simple! Thanks, Katie! Those cookies sound awesome! Now that looks amazing, Beth! It’s lunch time and if I could I’d make this pie my lunch! 🙂 Great photos, too! That’s so cool that your dad has a blog, too. 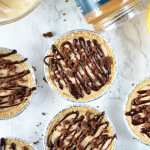 This pie looks awesome, and I love the idea of a butterscotch ganache! Yep, I’m drooling now. This looks so delicious! Wow incredible! This pie looks amazing! I’m really impressed, I must try! Thanks, Jess! I hope you do try it! Aw that is so fun that both of you have blogs and know eachother’s lingo and all the stuff! 🙂 And the new theme looks great! 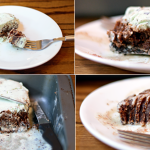 Oh my goodness, this pie – Beth, the ooey gooey thick and fudgy is too much! I think I could finally bridge the gap between my brownie heart and my butterscotch brother. Pinned! Thanks so much, Mary Frances! It’s nice to have an actual person to talk about blog stuff with, haha. Thanks for pinning! Holy cow…this looks amazing! I, too, think “Yup, pie, done” quite often…but it’s usually when I’m looking at an empty pie dish. 🙂 Two thumbs up! Thanks, David! And yes, that thought has definitely crossed my mind after all the pie is gone too! Beth! I lost you in my Bloglovin feed! I don’t know how! Glad I found you again 🙂 This looks divine! That is so cool that you and your dad have blogs 🙂 Yay on the new theme, it looks gorgeous! 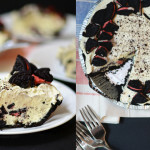 And oh my goodness, this pie – its amazing!! 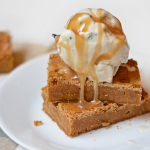 Butterscotch and brownies sounds phenomenal and so ooey gooey delicious! If I saw this on a restaurant menu, it would definitely be my choice. I agree with you that there aren’t even nearly enough butterscotch things in this world – my favourite flavour! Love the fact that there are so few ingredients! How fun that you and your dad can talk blog stuff!! 🙂 And this pie *swoon! * It looks incredible! Pinned! Well don’t these just look delightful!